Project Perfect Mod :: View topic - It's Time for a Lashing! It's Time for a Lashing! Posted: Sun May 24, 2009 4:43 pm Post subject: It's Time for a Lashing! Everyone thank Dutchy, for his Lasher Tank! I made a few modifications to the model myself, but Dutchy did a great job recreating this tank. I'm still trying to think of a way to make it unique, but thats for a later stage in the game. Anyways, enjoy. Is it possible for them to gain cash whenever they run over an infantry? Or perhaps grind an infantry if theyre right in front. Method 1: each spike is 4 vertices, a triangular prism if you will. Just don't forget to delete the polygon face that is in the roller. Method 2: create a plane. Weld 2 vertices together to form a triangle and, violà, a spike. Yeah, they'll be paper thin, but they're spikes nonetheless and they'll cost you a measly 1 polygon each. You can also reduce the amount of sides the roller has which would, in turn, reduce the number spikes on it. The really thin barrel on the Lasher looks way too complex for something so small. Optimise by removing the subsections or making the barrel have less sides. 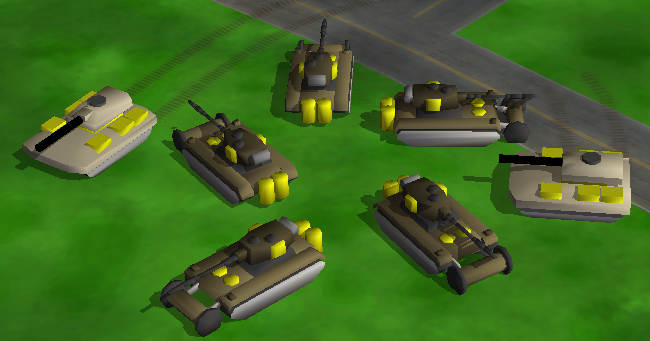 Also, that Rhino Tank on the far right looks like it's doing a high speed drifting turn. this is the comparison between a lsher with spikes and onw without. I haven't really gone into animating models yet, but it would be possible to make the spikes spin right? Anyways, that would be perfect dutchy. I guess the Yuri Scheme (RGB) is: 117,107,73 for light and 80,73,50 for dark. Personally, I open up voxel viewer and base my models directly off of the voxel, but whatever works is great. Yeah, was gonna say theres no real point in the barrels on the back, if you need a few more polys. Also, spiked version looks loads better (though you made it taller?). Rhino looks empty compared to this. But in the art theyre not quite as big, nor stick out so much. 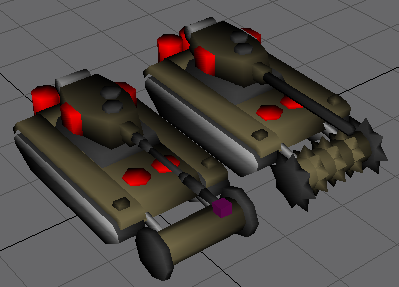 The ingame ones are surrounded by a box, and although you may not notice them much, they do give some needed remap. And to Dutchy, the second I get to my toher comp I'll send the file over to you. Do you want the gmax, w3d, or both? Sorry for the late post but damn those lashers are great,especially the one with spikes! Can't wait to show those fancy tsunami tanks what a real light tank is like.